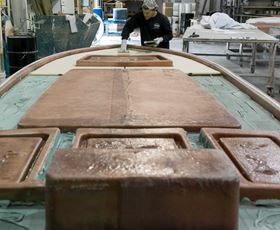 A marine deck foam core put down using Core-Bond. Scott Bader North America’s Core Bond system has been awarded Product Design Assessment (PDA) certification for composite core installation by the American Bureau of Shipping (ABS) for marine and offshore applications. The three Core-Bond adhesive grades (B70/ B72 / B73) and the two spray grades (B71/ B75), plus the ATC priming and sealing resin ortho and ortho/DCPD options have all been awarded a PDA certificate for sandwich core construction of fiber reinforced plastic composite parts by hand lay-up or vacuum infusion, which can be installed on an ABS classed vessel, mobile offshore drilling unit (MODU) or offshore facility. ’This product design accreditation from ABS for our Core-Bond system is a major feather in our caps as the marine and offshore industry is one of the toughest sectors to meet,’ said Jean-Pascal Schroeder, COO of Scott Bader North America. Core-Bond was initially developed for synthetic core foams, but later also proved suitable for bonding in balsawood cores. The two-part system works by having the Core-Bond adhesive and priming resin cure together at about the same time. The priming resin also serves to fill the voids between the cuts in the core or the bleeder holes in plain cores.